Ever wonder what goes on at our hatchery? Find out on April 6. Stop by our Open House, the first Saturday of each month (excluding July, August) from 10:30 a.m. to 12 p.m. These are drop-in sessions, and a great opportunity to learn about the salmon rearing process and the hatchery. Find out how you can get involved as a volunteer, or just come by and say hello! To find us just Google search: "Hoy Creek Hatchery"
Here's more information about Getting Involved with us. 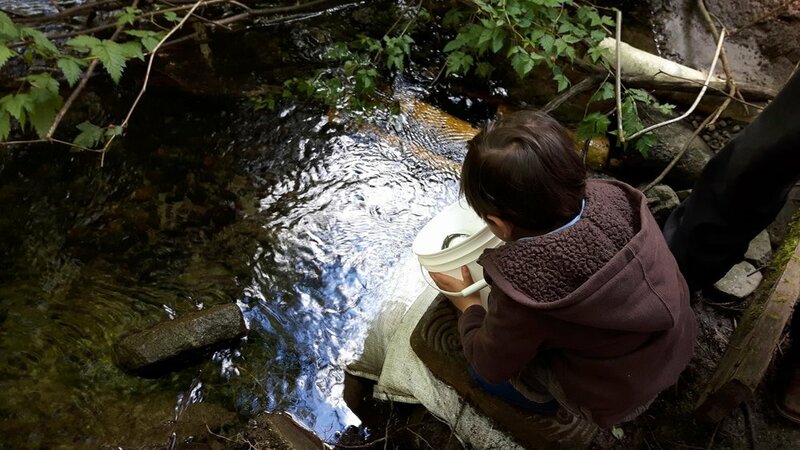 Join the Hoy-Scott Watershed for Salmon Leave Home on Sunday, May 12, 2019 and help release coho smolts into Hoy Creek. Activities get underway at 11 a.m. and run through to 2 p.m. at the Hoy Creek Hatchery. 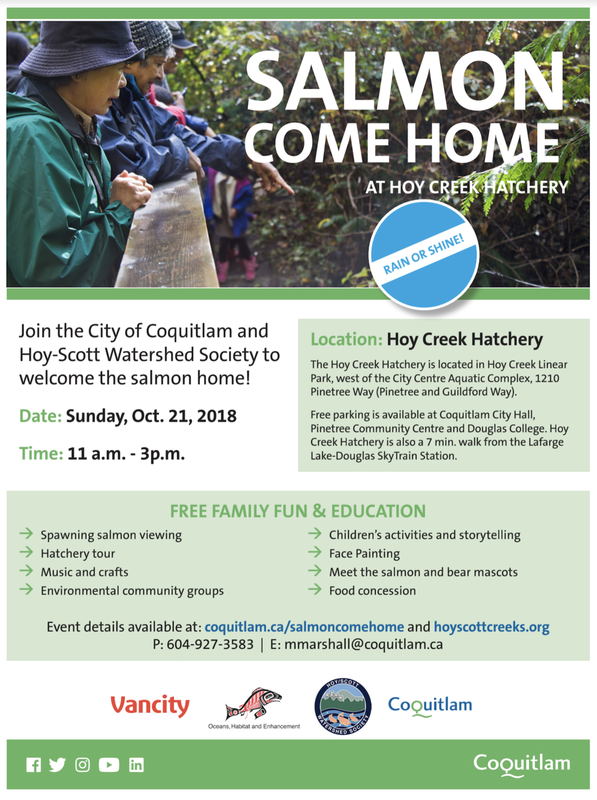 Hoy - Scott Watershed Society, (HSWS) is a not-for-profit, volunteer-run environmental stewardship group, that conducts a salmon enhancement program in partnership with the City of Coquitlam, and the Department of Fisheries and Oceans Canada. We are actively involved in watershed restoration, public awareness, education and preservation. Join the Hoy-Scott Watershed Society for our next monthly meeting on Tuesday, April 17 at 7 p.m. at Coquitlam City Centre Library on Pinetree. Open to new members / volunteers, and the general public. We aim to keep our meetings to one hour in length. *NOTE: No regular meetings are held in July and August. Looking to volunteer with us? We'll be hosting monthly volunteer orientation sessions at the hatchery, the first Saturday of each month (excluding July, August) from 12 noon to 1:30pm. These are drop-in sessions, and a great opportunity to learn about the salmon rearing process and the hatchery, and ask questions. Join us for our next monthly meeting on Wednesday, October 21st at 7pm. Location: Coquitlam Library. Open to new members / volunteers! On Saturday morning on August 22nd, Hoy-Scott Creek Society members will be walking along and in-stream collecting trash at Hoy Creek.